← Emoto’s Rice Experiment: How much power do words truly have? My kids love spaghetti. Seriously, I have four spaghetti monsters. It’s a great quick, easy meal when we have a busy evening of activities ahead, or when I just don’t feel like spending all day in the kitchen. It’s also perfect for the evenings when my boys have dinner duty. That being said, as I’ve mentioned before, I love finding new ways to re-do our traditional favorites. This spaghetti offered all the ease of a traditional version, but with a nice Mexican feel and a little ‘kick’. Everybody, including my husband (the pickiest of the bunch) came back for seconds. My husband may, or may not, have had three helpings. In a large bowl mix together the chicken, soups, tomatoes, and sour cream, stirring until evenly combined. Add in the cooked and drained pasta, stirring until evenly combined. Cover with foil and bake for 30 minutes, or until hot and bubbly. Sprinkle with cheese and return to the oven, uncovered, until melted. 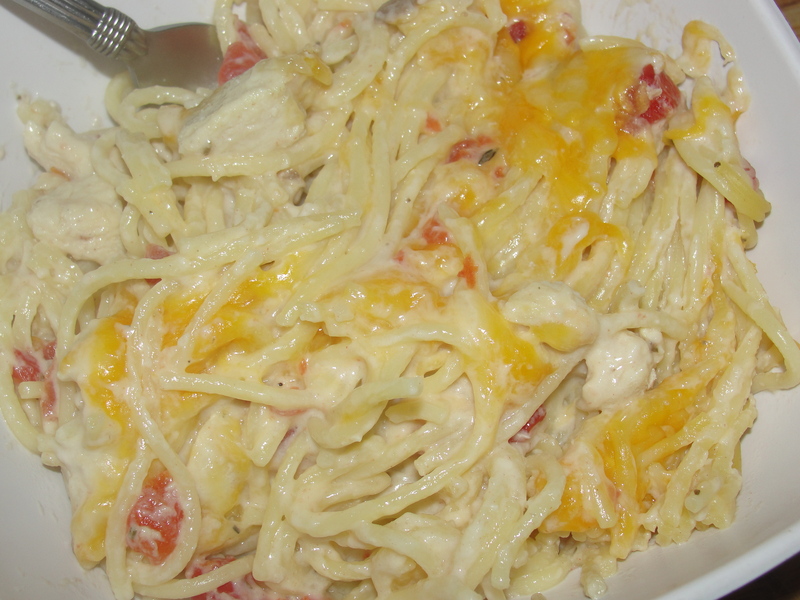 Posted in Recipes and tagged cheesy, Chicken, dinner, Mexican, pasta, quick and easy, spaghetti. Bookmark the permalink.